It has been some time since I wrote and hope to get things going soon. I want to share something with you now though. For two weeks I was visiting my children and grandchildren. I had not seen them since last January and this was a much wanted and needed trip. I will post more of that later and/or on this blog or my other one. Something happened up there, well lots happened, but something very appropriate for a Sunday post. TJ, very excited about learning this: I learned what obey means! Grammie (me): OH? What did you learn? Grammie: And what does that mean? TJ: It means if they say go to bed, then I need to go to bed. Grammie: What else does it mean? TJ: If they say pick up my toys, then I need to do it. Grammie: Sounds like you listened well. TJ: Yup, what they tell me to do, I need to do. Grammie: TJ I thought you learned to obey in Sunday School today, what happened? TJ: I LEARNED IT BUT I DO NOT WANT TO DO IT!!! Makes me wonder, how many times do we do that to our Heavenly Father? Yup, it was in my vows. It is in the Bible. Too many today, to either avoid breaking the vow or out of following the worldly advice, do not have “obey” in their vows. It is not a word we like. Submit, obey, gives us a bad feeling. Most of us are independent, have a brain and think it means we can’t use it. Not So! We are to obey and submit, but he is to love. Someone who is loving and you know has your best interest at heart is much easier to submit to. Look at the verses. We are to obey our husbands as we do the Lord. He is to love us like the Lord loves. WOW! We both have tough jobs that really can’t be done on our own. He must depend on God to love us that way and we must depend on God to obey. It is only through drawing near to God and work on loving our husbands that we can be submissive. 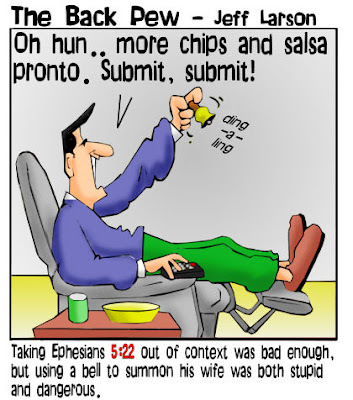 I have a loving husband and most of the time do not have a huge problem submitting. We talk things over and I give my thoughts, or Scripture or desires and he gives his. Most of the time we come to agreement, and very often it is he seeing I was right. He is not a “pansy”. If we have a real disagreement I submit to him. It is our husbands who will face the Lord someday for how they treat us, but we will face Him for our submission. God will also bless us for submitting. However, watch your attitude!! If you are like me there are times that I give in with a grumbling heart. This is not submission! Submission is to humbly and lovingly let him make the decision because it is not only in submission to him, but in submission to God. Like the cartoon above, I have seen marriages where the man thinks he is the boss. His wife is the peon slave. Not so ! When God said that he will make a “helpmeet for Adam” He meant a helper fit for Adam. Someone to walk by him and help him. A tyrant boss is hard to help. If you are in a marriage like that, pray for your husband. Do not pray with the attitude that he needs to change for you, but, rather, that he should change to please to Lord. Ask God to show you how to be the wife he needs to reach him. This will take changing on your part too.